Bees and wasps are not traditionally considered as a public health nuisance in the way that rats, bedbugs or cockroaches are – though their sting is obviously something to be avoided! However, although generally they do little harm unless provoked, there are times when their needs can come into conflict with people – especially when their nesting sites are disturbed – and then they may become aggressive. Although they are superficially similar to look at, they are quite different beasts, living entirely separate lives. Bees have hairy, thicker-set bodies with flattened hind-legs for carrying pollen, whereas wasps are slimmer, narrow-waisted, smooth and shiny. While the value of bees as beneficial insects in the garden is legendary – it has been estimated that honey bees are responsible for over 80 per cent of pollination – wasps too are good friends to the gardener, though often their contribution is little recognised. Honey bees live in colonies which may number 40,000 or more individuals. The nests are constructed from combs of wax, hung vertically usually within hollow trees or roof or wall cavities and remain in active use throughout the life of the colony. Bees feed only on nectar and pollen, though like wasps, honey bees occasionally visit rubbish bins and soft-drink cans in search of sweet, sugary foods. Although generally non-belligerent creatures, the urge to protect their nest is very strong and honey bees can act very aggressively when they feel it is under threat – sometimes simply walking past the entrance can be sufficient to enrage them. A colony beside a footpath, school or house entrance is an obvious recipe for major problems. If removing a nest becomes essential, the best person to contact is often a bee-keeper (local authorities or wildlife trusts will be able to provide suitable names and contact details). Destroying a nest should be the last resort; a variety of products including powders, aerosol sprays and foams are available if the need arises. Honey bees are also prone to swarming, particularly in spring or early summer. 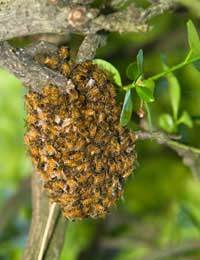 Most swarms will usually move off within a few hours and generally cause no harm if they are left undisturbed. If, however, it persists beyond two or three hours, again the advice of a bee-keeper should be sought. Other kinds of bees – particularly masonry or mining bees – can sometimes cause a problem. Broadly similar in appearance to the honey bee, but much hairier they are solitary insects and do not live in organised colonies. The female lays her eggs in holes which she makes in soil, mortar or masonry. Control largely focuses on re-pointing defective mortar and making good any cracked brickwork, ideally in late summer to avoid both bee breeding and frosts; these bees are, like their cousin the honey bee, beneficial insects and help with pollination. Contrary to the commonly held belief these insects are not lacking in all redeeming features at all, since they eat aphids and caterpillars and help clear up the remains of dead small animals; their close relatives, the hornets, also consume huge numbers of flies and caterpillars. However, the fact remains that they can and do sting, often repeatedly – unlike bees – and the large numbers in a single nest, which can be 25,000 or more, make them a serious potential hazard. Wasps build their nests, which are newly made each year, from paper, pulping woody plants for the raw material and selecting sites in lofts, wall cavities, old rodent burrows, hollow trees and bushes. If the location of a nest makes its destruction necessary, then the same kinds of products as can be used against bees, will do the job. Tackling the nest is probably best left until a cool day or late in the evening – and protective clothing is essential to protect against the enraged insects. Spotting the entrance is seldom difficult; the powder or spray should be applied to this hole, in accordance with the instructions and then the nest left alone. Although wasps may form a swarm for an hour or two, shortly afterwards they will begin to die off. Marauding wasps often seem routine features of outdoor eating – arriving uninvited at almost any picnic or barbeque – but fortunately wasp traps filled with sweet sugary solutions can be bought or made and provide a very effective way to keep these pests from spoiling your day. While in most cases, both bees and wasps are fascinating and enormously beneficial creatures, there are times, sadly, when their proximity simply cannot be tolerated. Aside of any potential contamination of foodstuffs and disruption of barbeques, babies and some particularly susceptible individuals can be badly injured, or even killed, by wasp or bee stings. If they do pose a threat, there are readily available products – and a variety of professionals – to help the householder deal with them.